Some time ago Freestyle Now co-founder and full time squad member Shaun Jarvis was approached to help write a book on bmx freestyle tricks. The chance to help out with such a project does not happen all the time so Shaun jumped at the chance. The main reason that Shaun wanted to help out with the book was to use it as another medium to promote the sport of bmx freestyle. 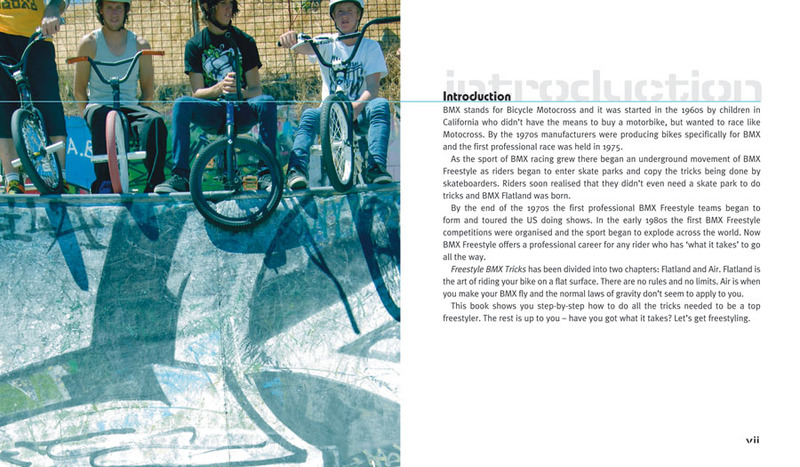 When Shaun and co founders Brad Dyer and Georg Molnar started Freestyle Now it was to promote the sport of bmx freestyle, this has always been the main objective and with the book it was just another medium that could be used to do this. 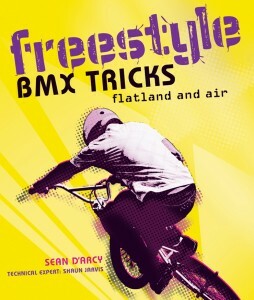 Freestyle Now has some copies of the book which you can buy through Freestyle Now via EBay. Freestyle BMX tricks the book is divided into two styles, flatland and air. Flatland is for flatland tricks and the air tricks relate to anything done on a ramp or skatepark. The book is targeted at beginners riders who want to increase their skill level. The book takes readers through 39 tricks step by step and reveals the secrets to every trick’s success, providing insider’s tips and techniques and common problems. Shaun Jarvis also adds in his trick tips which will help to learn the tricks quickly and easily. Bmx freestyle has been around in a semi official capacity since the very early 1980’s. People were doing tricks on bikes well before then but the official wording bmx freestyle did not start till then and people and riders started to see this form of bmx riding as a new form or something that was worthy of input. The tricks that were being done back then were of the basic form and backflips were not even contemplated let alone a tailwhip. Progression is what drove the sport, riders wanted to progress and one up the next rider, what more could be done. The tricks in bmx freestyle are endless. Even now over 30 years later the progression is still what drives the tricks. Freestyle Now squad member Shaun Jarvis has been riding bmx since 1981 and witnessed the growth of the sport in Australia and around the world. From its infancy to now although the tricks have progressed the fundamental ethos of riding is still the same, ride bmx, do tricks, have fun. The freestyle bmx tricks book is an instructional book that will help the beginner or novice learn basic to advanced bmx tricks on ramps and flatland. It is not really target at the expert level rider. The format is simple to understand with tricks broken down into three basic steps. Although the book has been published around the world Shaun did not take any monetary return for helping put the book together, his payment was “If the book can get people stoked on riding and more people into the sport then that’s enough payment for me” This statement has had some impact as Freestyle Now received an email from Steve S in Glendale Heights in Illinois America, and he was stoked on the book and the content. I recently grabbed a copy of the BMX freestyle tricks book on Amazon, and I wanted to write and say thanks for it, and for your website. I’m a 38 year old want-to-be flatland rider from the US and find your book very helpful. I rode a little in the 80s and am trying to get back into it. With the help of your book, I managed to bunnyhop a rolled up t-shirt yesterday after only a few attempts. I know it doesn’t sound like much, or very impressive, but it has inspired me to keep trying and not feel as self conscious about being an old guy on a kids bike. haha. I was wondering how tall Shaun is as I am 6’3″ and had written myself off as being “too tall” to learn flat, but Shaun looks like a taller guy, so maybe there is hope for me yet. Anyway, thanks again for putting out the book and website. It has helped remind me about what having fun on a bike is all about. Take Care. Upon showing Shaun this email he was super psyched, with a large smile on his face, he knew that even if only one person was stoked on his input into the book then that was what he set out to accomplish. If you are keen to pick up a copy please send us a contact or go via the Ebay site . Back in January Freestyle Now performed some bmx stunt shows at the Perth Skyshow to celebrate Australia day. Freestyle Now set up two bmx jump box ramps on either side of the FMX ramp from ASP Xtreme. Freestyle Now squad members David Pinelli, Dylan Schmidt were joined by reserves squad members Matt Adkins and Brady Thomas and our new recruit member Jack Carwardine also came along. 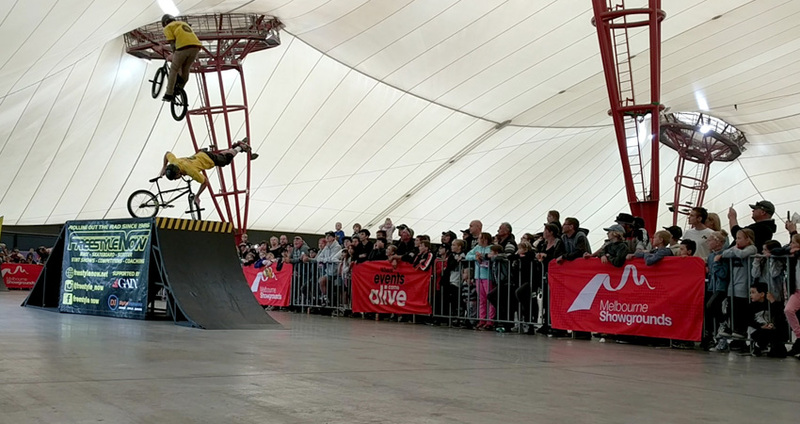 It was a rad time throwing down two bmx stunt shows at the same time with Kim Bloodson on the mic on one ramp and Shaun Jarvis on the other. Freestyle Now also invited Josh DeReus and Ryan Aquilina along help roll out the rad to the Australia day crowds. Freestyle Now performed some great entertaining bmx stunt shows. 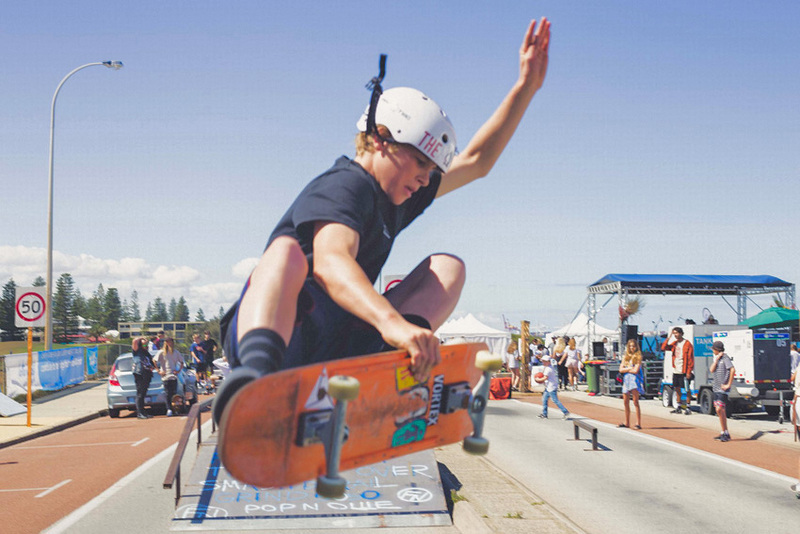 Many rad tricks took place and the people were entertained. 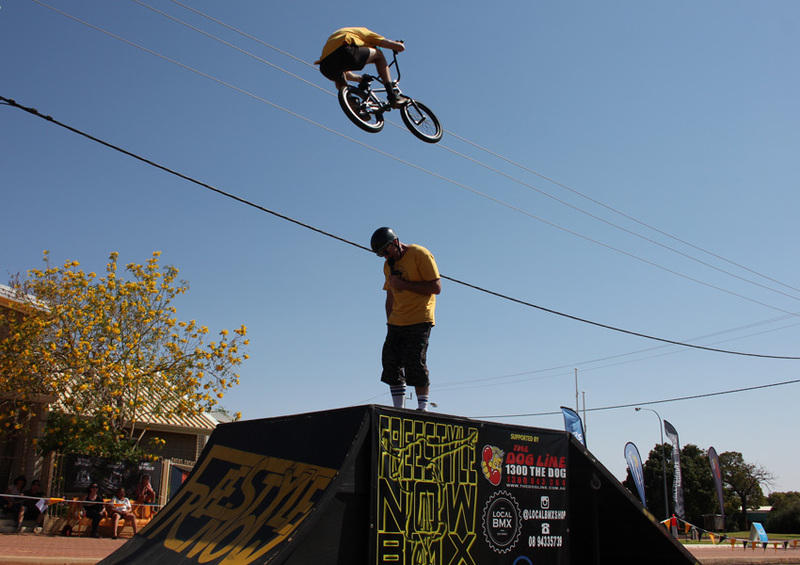 Be sure to check the video of the bmx stunt shows that Freestyle Now did at the Perth Skyshow below. So much radness. 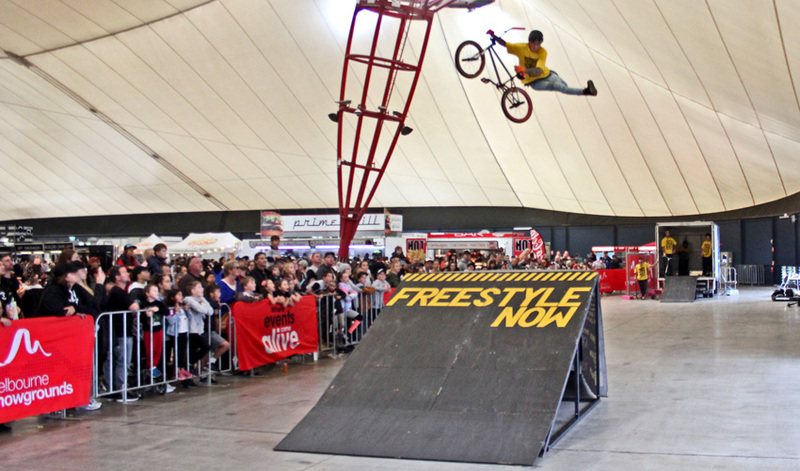 Make sure you check out our coming events page to see where the next Freestyle Now bmx stunt show will be going down. If you would like this type of great entertainment at your next event please get in contact with Freestyle Now with your requirements. Freestyle Now squad member Shaun Jarvis has been riding bmx for 34 years. He is always down to ride. 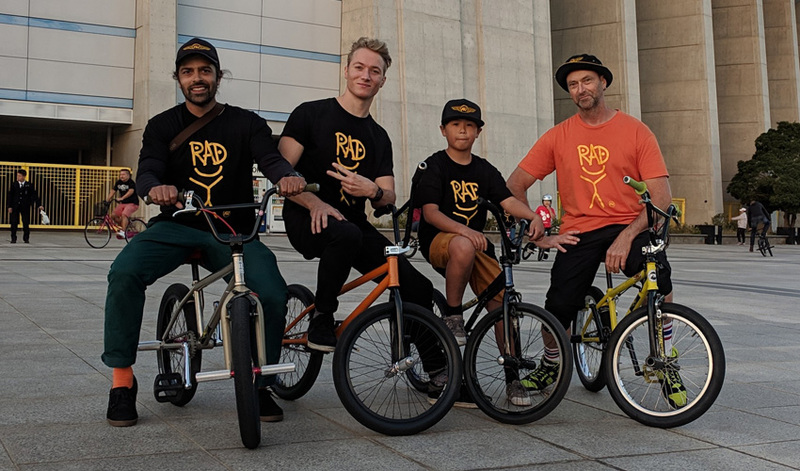 When German rider Thore Saggau came travelling through Shaun’s home city of Perth a new years day bmx flatland session took place at the famous Scarborough beach. With a amazing sun set as a back drop the two riders rolled out the rad till the sun went down. “Well I guess ever since I started riding freestyle BMX way back in 1995, I came across a video called “Wheelies” That video had, and still has some of the best flatland riding caught on film. Ever since seeing that video, I have wanted to go to York Pennsylvania to ride at the annual event called ‘York Jam’.Earlier this year, while I was on Facebook, I saw an advertisement for the “25th anniversary of York Jam”. I decided just by seeing that ad, that if I was rostered off work, I was going! It was that easy. I looked up my roster and checked that I could go! All that was stopping it, was a decision of “was it worth it”? That was easy to decide. I had always dreamt of going to meet the best riders from the world, the riders who made flatland what it is now! So I said this is it, the Jam has rolled for 25 years, if I miss this one they may not have another! It was the easiest decision I have ever made. So next I was booking the flights and accommodation, car hire etc. Then I thought I would see if anyone wanted to come along. I ended up getting my friend Simon to join, he was stoked! Simon and I had started riding together back in 1995. He knew the video and the people we were heading to go and hang out with. It was game on! We were booked and ready to go, next I received the worst news from Simon, “man I have broken my leg and torn an ACL and Ligament too”. Oh no way, I was like “so I guess you can’t go”? Simon was like “hell no, I’m going”! 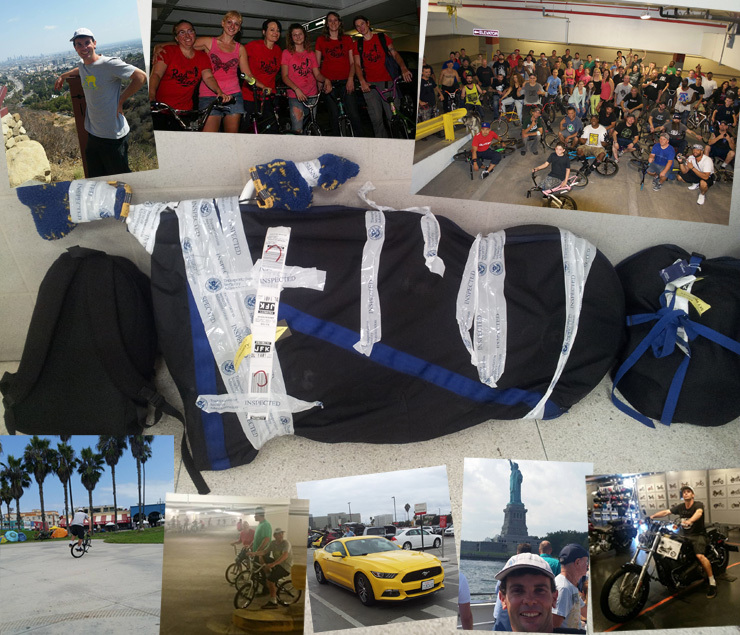 So despite the major setback Simon pushed through the pain barrier and discomfort and made it along for the ride. We left Perth flying via Sydney and then flew onto Los Angeles. We saw Santa Monica Beach, Hollywood, and Huntington Beach. As fate would have it, when we left Huntington Beach Simon noticed a rider in the car park. I was like “No way! That looks like Gabe Weed”! We decided to go see who it was, Yep it sure was Gabe Weed, he was just about to have a ride. We had a yarn and rode some flatland for a bit. 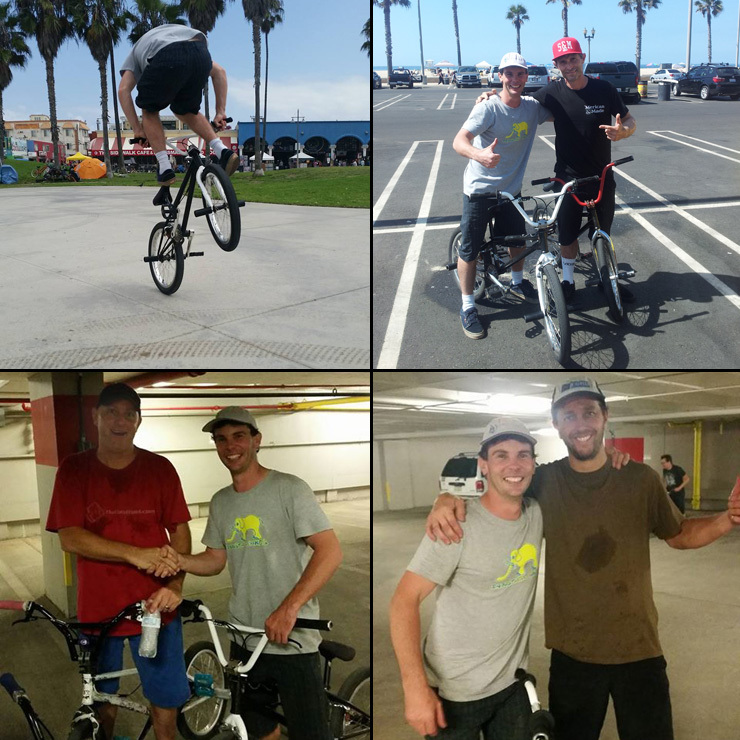 Simon and I could not believe it, what is the chance of meeting one of the best flatland riders like that. We then drove down to Las Vegas in a Ford Mustang. That is a must if you are ever going to go see Las Vegas, Simon drove most of the way. We went to Hoover dam then arrived at Los Vegas. After we were in Vegas for a few days we headed to the East coast landing at JFK airport, New York. We had made it to the big apple AKA New York. We did the tourist thing and saw Brooklyn Bridge, Empire state building, and the Statue of Liberty. We also ate the best Pizza ever! NY is not my scene that’s for sure but the Pizza is so good. We got out of NY and headed to the place we had been waiting to ride since we started riding. The drive was awesome, we saw so much. Once we made it to York we got on the “Buffalo wings” and did a wall mart visit. Simon was loving it! He wanted to get a bike and ride at the jam. So Friday 11th Sep 2015 the Pre jam day arrived. We headed out to find the spots that were on the advertisement. No one was there yet. We decided to do a Harley Davidson tour while we waited for the jam to start. The place is heaps cool. Interesting fact that Australia is the second biggest purchasers of Harley Davidson other than the US. So about 3.00pm I get a message from Brett Downs on Facebook, Saying “Let me know when you want to go ride”! So I replied “I’m at the Hidden Spot now”! So I was doing a manual and a car pulled up. It was Brett he was like” You want to come ride, with Kevin and me at the Pit”? I was like “Yeah that would be sweet”. So Simon and I followed Brett and we meet up with Chad, Ivan, Terry and Kevin. It was so cool to see Mr Jones ride in person. He cranked up a heap of speed put one foot over the bars and did the longest no handed nose wheelie I had ever seen! EPIC was about as good a word I can think of to describe it. The man is KING! I could not believe how lucky we were, to be able to hang out with these guys. The typical BMX crew, who I had never meet before, but felt like I had known them all of my life! So after hanging with the crew, we headed back to the Hidden spot and started to meet some of the people who also made the long journey to York P.A. Riders from all over the US and Canada had made the effort to be at the 25 year jam. It was so cool to be apart off. We rode until about 8.00pm then headed out with everyone! The day had come and after 3 months with no rain in York, the only thing that could ruin travelling over 18000 Km’s was RAIN! Yep it sure did “It pissed down all day”! But in typical flatland style we had plan B. Lucky the locals knew of the best spot in York for this 25 year jam to push on. We had a whole multilevel car park all to ourselves. Well unless the local authorities were to show up! Everyone headed, to go ride in the car park out of the rain, It was awesome I think at least 150 riders made it for this year’s jam. Also we had six girls show up to throw down some flat action, they were all awesome!! The rest were “two tired”. No that was just a real bad joke! Mark Eaton was cranking tunes all day it was like being in the video “Wheelies” but it was real life. LOL some awesome riding was done and heaps of tricks were pulled. After a full day of flatland, we headed out yet again. We made heaps of new riding friends for life. After a huge night with Lincoln and Matt, everybody reunited and jammed again at the George st spot on Sunday. It was awesome getting to meet hero’s you never think you will ever get to meet in your entire life. So many good riders and the scene was like when I saw “Wheelies”. Thanks to Diggs and everyone who organized York jam. Simon and I left the next day we had 28 hrs of flights and 2 days of travel ahead of us. And then straight back to work for me. For anyone who has a wish to or thought of an event that you have always wanted to attend, just go for it and make it happen, you will be so happy you made the effort. Freestyle Now recently performed some bmx stunt shows at the Brisbane Rally Cross event. Rally Cross is car racing done on a combination of dirt and asphalt over huge jumps with up to 10 cars competing at the same time. Freestyle Now performed some bmx flatland and kicker ramp stunt shows to the crowds. 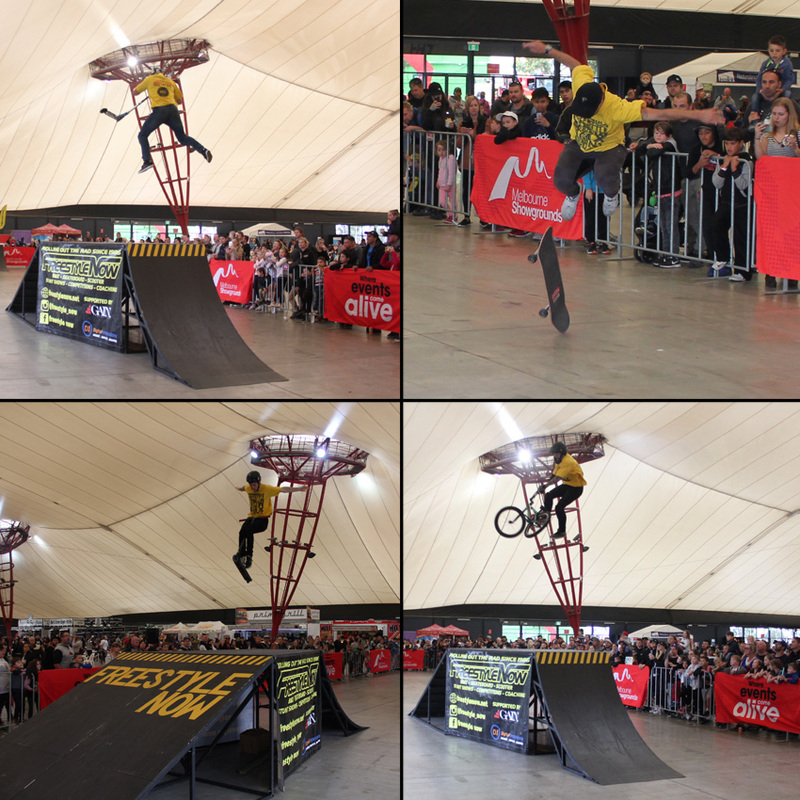 Make sure you check out our coming events page to see where the next Freestyle Now bmx stunt show will be going down. If you would like this type of great entertainment at your next event please get in contact with Freestyle Now with your requirements. 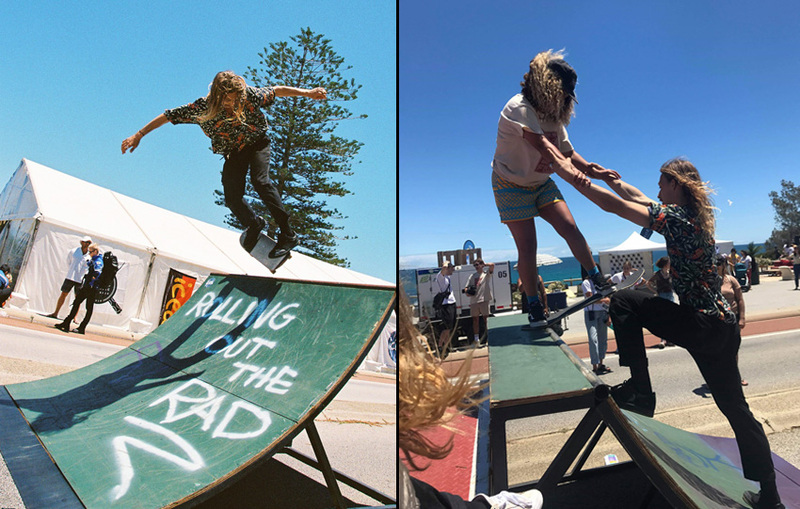 Clockwise from top left – Reece Jones hits the kicker and throws in a barspin – Paul Chamberlain rolling a hitchhiker – Lee Kirkman scuffs and spins for the crowds – Paul Chamberlain spinning.